Talking about carrots – Mumma, Did You Know? I can’t take any more sad talk for the moment (today was the funeral), so here’s some carrots. 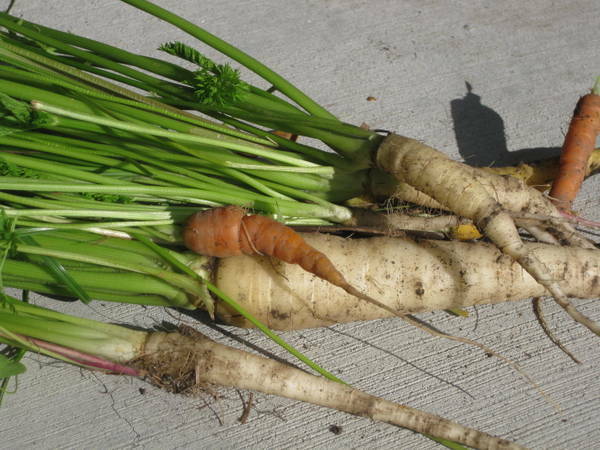 I pulled these up during the week – I really like growing carrots, there’s something so satisfying about them. And they’re just there, for whenever you feel like harvesting them – no rush. When I have a bad week, I pull up some carrots. This is my latest harvest, I sowed carrot seeds down both sides of the garden bed but they only sprouted down one side (I have problems with a bush turkey digging through my garden, I blame the turkey). I pulled these up and noticed that although not all the carrots are big, they are all very straight. This is good – it means that I prepared the soil properly for them. But also bad – no interesting carrots to look at. Then today I was weeding and saw two more carrot tops in the marigolds. I pulled them out and a marigold came with them. One carrot was wound around the marigold roots, so I separated them, and it was a legged carrot! Do you know the kind, where the carrot splits in two and it looks like it has legs? I was very pleased. It’s good to have at least one interesting carrot.